At Wilson Bros Gardens it is our goal to blow you away with a great selection of the most exciting new and old-favorite plants and trees that have demonstrated outstanding qualities and exceptional performance in landscapes and gardens. Wilson Bros Gardens offers and ships high quality, container-grown, nursery and garden center plants that are ready upon arrival to plant and thrive in your landscape and gardens for years to come. Wilson Bros Gardens offers many types of plants and trees that are grown in various size nursery pots with developed root systems growing in various types of soil media. We ship all of our plants in their pots. 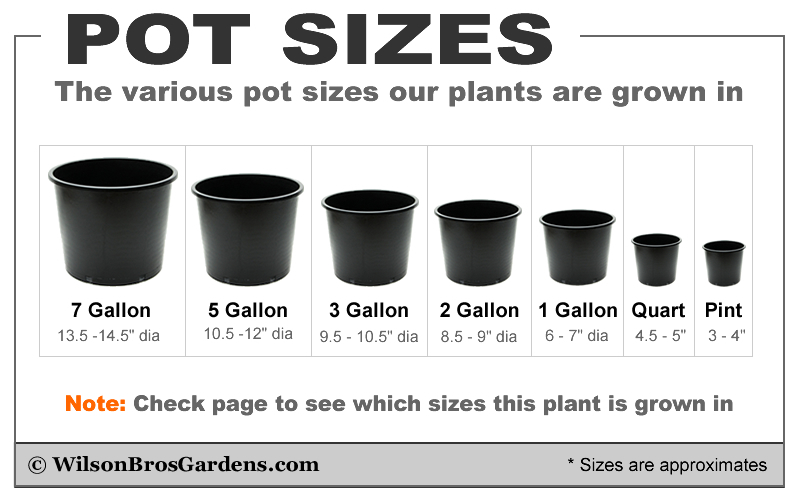 While a pot size will always be consistent or within a specific range, the size of a specific type of plant can vary based on several factors. Plants are a living thing and healthy ones are always growing. Based on the time of year, the age of a nursery crop, and scheduled maintenance pruning, the same plant growing in the same pot won't stay the same size for long. 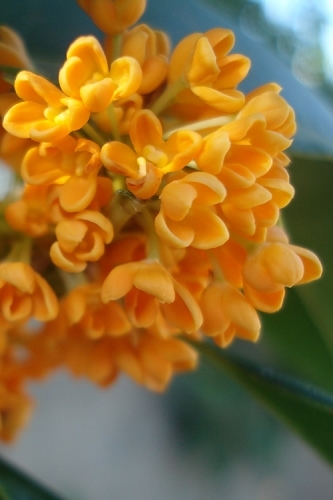 For example, at any given time we might have three or even more crops of Orange Tea Olive plants all growing in the same size nursery container, such as a 3-gallon pot. One crop might have been planted January 1 of the previous year, another crop April 1 of the previous year, and yet another crop on August 1 of the previous year. So, if it is April in the current year we might be offering the January 1 planted crop from the previous year for sale in our online store. By June we may sell out of this crop and are offering the crop that was planted April of the previous year, and so on. Crop scheduling may sound a bit confusing to anyone not familiar with it, but the point we're making is that the size of plants will vary based on the time of year they are purchased and the stage at which they are in the growing process. For example, let's say you purchased a 3 gallon size Orange Tea Olive from us in February and then in July you decided you wanted to purchase another one in the same 3 gallon size pot. The 3 gallon size Orange Tea Olive you purchased in February might be from the tail-end of a crop so was 42 inches tall at the time you received it. Or maybe we had recently performed a scheduled late winter maintenance pruning pruning so the plant was 36 inches tall. But the second plant you purchased in July could be from a newer and younger crop and might be 30 inches tall. So you see, unlike purchasing a specific type of tire for your car, which will always be the same size, plants will vary in size based on the explanations provided above. You can rest assured that when purchasing plants from Wilson Bros Gardens, though we can't always guarantee that the same plant purchased at different times of the year will be the exact same size, we do guarantee that you will receive healthy plants with a developed root system. This said, if you purchase several plants of the same variety in the same size pot at the same time, our staff does its best to pick plants that match. Why Does Wilson Bros Offer Only Larger and Not Smaller Size Plants?